Can E-passports Make the Airports Smarter? The most common document needed to cross borders is passport. It is impossible to travel abroad with no legal passport, especially when you are flying. However, identity theft and identity fraud have the potential to make illegal migration and border prohibitions look like a normal practice. Therefore, nations even with stringent travel protocols worry about the illegal immigration, unlawful border-cross activities, and homeland security. Latest technologies have been incorporated at various levels to make travel-related documentation go through a rigorous and authentic scrutinization process. The way we access our phones, operating systems, and computers using fingerprints, voice, and face recognition, is a sure sign that tech-rich digitization and cyber security has become an integral part of our lives. Foremost examples are biometrics and electronification of documents like driving license, e-passport, PAN card, and so on. With the help of advanced technologies like robotic, automation, Artificial Intelligence (AI), and Blockchain, standardization of international travel documentation has been evolving continuously over the last decade. Physical verification of documents has had always left subtle and undetected loopholes. At one or another checkpoint, people get away by manipulating or tampering with the documents. It’s the International Civil Aviation Organization (ICAO) that sets standards for passport and many other documents needed for international travel. Earlier, passports were made of thick paper with no provision for digital photograph. Today, in most of the countries, passport authorities have made transition from paper-based passport to plastic laminated papers or full-page plastics. With a few more added features, these passports have moved ahead from the realms of tampering and counterfeit – also stay durable and long-lasting in moist conditions. Across the world, the standard of issuing passports has improved drastically. However, it still makes you wait for long time at the airports for check-ins, baggage clearance, while showing boarding pass to enter airside. On the other hand, airlines wish to provide you seamless travelling experience, but they cannot compromise on border security rules laid out by government bodies and other stakeholders. Will this problem find a solution if biometric-backed e-passports become a norm? In 2016, around 4 billion people flew, and the number is expected to become double in next two decades. Are the airports of today well-designed and will be able to handle such large crowd without forming crowd and dissatisfaction among passengers? Clearly, airport infrastructure cannot grow with such pace. They need smarter solutions. They need to rely heavily on technology integration. Acceptance of e-passports across the world may save passengers forming immense crowd at every juncture. Around 10 million people fly everyday throughout the world. Airport or security authorities are burdened with the responsibility of increasing vigilance in minimum time. Any system like biometrics, if comes into effect, will prove boon to them. It will reform the air transport like never before. Around the world, developments are underway. The trend of e-passport, which contains an embedded chip inside, is catching up fast. The US has already made it mandatory to have e-passport for its citizens, while in the UK every passport holder has that chip in it. Is Biometric all set for operations? The broad objective behind all-biometric airport is to build advanced airports that can facilitate the overall traveling experience with no or less fraudulent activities. In the biometric ambience, once you authenticate the ownership of data through facial recognition (with the help of fingerprints as well) present in your passport, you will be able to zoom through all the security checkpoints without the need to show any of the travel document. The details given on your passport must match through your biometrics – also known as match process. Inspired by Blockchain, the whole experience then becomes ‘Single Token Travel’. Under the ‘Single Token Travel’ enroll process, passengers can scan their passport and take a selfie using smartphones to validate the data printed on their passports. It’s a fun way to validate yourself before check-in. Many airline experts have suggested that face recognition technology has the charm and power to smooth out the overall departure process for customers. SITA, IT infrastructure and communications service provider to the aviation industry, is engaged into testing suitability and performance of biometric systems at many leading airports of the world. Their product development team already stated to some credible news sources that they are in the state of readiness. They did a trial in Brisbane, where at the initial entry point passengers registered for passport, boarding pass, and face image. The matching of data made them pass through other check-ins easily and at the boarding gate, just before the airside, they just looked at the camera and got instant recognition and moved on. Many passengers expressed the worthiness of the system, as they were happy with the speed and ease. Amsterdam’s Schiphol airport has been contemplating to become ‘a completely digital airport in the world’. By using biometrics and AI technology, they worked on a facial-recognition setup in association with KLM airlines. The purpose was to have passengers aboard the planes without showing documents like boarding passes, passports, and travel insurance, and so on. The process was simple. Passengers needed to attend face-recognition process at the kiosk set-ups. However, after the process, the kiosks deleted the personal data. The goal of the trial was to discover as how fast they could move passengers onto the planes. They wanted to check the efficiency along with time movements. This technology will advance with time, as it is going to see more serious algorithms of AI, machine learning, deep learning, and robotics. It is highly futuristic and will see its peak days in the near future. Not only this, it will become common too at airports and passenger terminals. ICAO ensures that e-passports are law-abiding and interoperable globally and identity-theft proof. Preserving one’s personal information is the prime concern, even in the event of passport loss or stolen. Current e-passports are designed with basic access control protection, it means only authorized bodies or persons such as immigration officials or kiosks may access the information, that too wirelessly. Some nations, depending upon the security measures, also issue e-passports with extended access control standards, though this feature is not widespread. Level of access controls are to be designed in accordance with the need of security and country laws. Even the data privacy is a major concern, but still it’s going to be a partnership program, as in the airport issuing government, and the holder must form a sync to carry out reporting and holistic governance. Even the slightest disruption from any of the stakeholders may cease the communication and decision making and bring the overall system to untoward halt. Biometrics is a part of airport infrastructure and is open for immense growth opportunities. Stakeholders from all fields must collaborate with an objective of making flying a seamless experience. The sooner they realize, the better they make out of their resources and investment. The key lies in converting existing chaos of today’s airports into a healthy eco-system. Stakeholders must come together to strike the perfect balance. 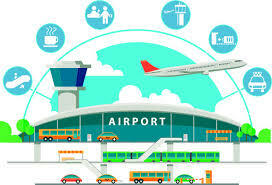 Like other industry trends, if the airport infrastructure is going to be backed by biometric or e-passport process, well it should be planned in most efficient and economical way. The need to have a seamless journey is every growing among passengers, and investors and stakeholders should not remain vary of their demands for long. They must try moving their customers from satisfaction to utility. With ever-increasing passengers in the terminals, the need to process to baggage simultaneously has added immense pressure onto the staff. It wouldn’t be far when passengers need to wait five to six hours to get their baggage cleared the necessary rounds. To ease off the pressure, the aviation industry should get technology-driven solution such as biometrics – that should perform all necessary tasks from basic check-in to autonomous processing and everything in between. Baggage handling is as bad as standing in the long que for security check. If it could be done by biometric, surely it will save a lot of time and divert the spare airport staff for attending customers. Some time back, Delta Air Lines at Minneapolis-St Paul airport used biometric bandwagon for self-service bag drop. Reports stated that it processed double in a given time than the manned desk. Biometrics bag drop system will save time of customers and keep a visual track of baggage handling. Worldwide many experiments and trials have been done to bring this biometric-oriented technology on the floor. The results have been positive so far and at many places it is being implemented for domestic passengers. Once it is approved with minimum pitfalls, then it will become as common as operating smartphones with fingerprint access. The key challenges are data privacy and the ability to handle large volume of crowd without creating insecurity and chaos. This technology can prove ground-breaking for crowd management, well then it can be implemented to various other fields too.